In Germany, the extreme right wears the uniform of "yellow vests"
Saturday, three organizations, including Pegida, mobilized in Berlin against immigration by asking their supporters to wear "Westen gelbe". With the yellow vest, the German far right found a new uniform. For the first time, three of its organizations called for a "yellow jackets gathering" on Saturday, 1 December, at the Brandenburg Gate in Berlin. 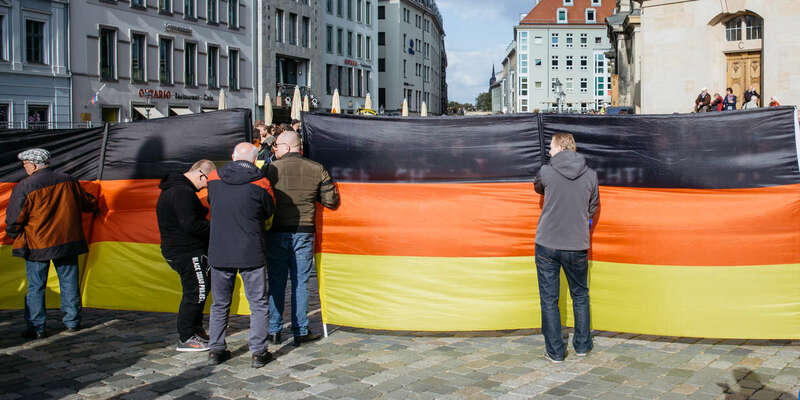 Pegida, a movement "against the Islamization of the West" , created in Dresden (Saxony), in 2014, Zukunft Heimat (Future Homeland), an anti-immigration group in eastern Brandenburg, near the Polish border and Merkel-muss-weg-Mittwoch, a group of opponents of the German chancellor who meets every Wednesday in front of his office to demand his departure, have gathered about a thousand people. Even though the far-right Alternative for Germany (AfD) party was not officially co-organizer of Saturday's rally, some of its leaders had made the move. Four days earlier, Princess Doris von Sayn-Wittgenstein, patron of the AfD in the Land of Schleswig-Holstein, posted on social media a photo of her in a lace-collar blouse and yellow vest, with this slogan : "Solidarity with French citizens".